Fuuny. . HD Wallpaper and background images in the SONIC COUPLES club. Sonic thinking...Yes=Prissy girl stuff in your hair.No=Hospital....I'VE GOT IT...OR. 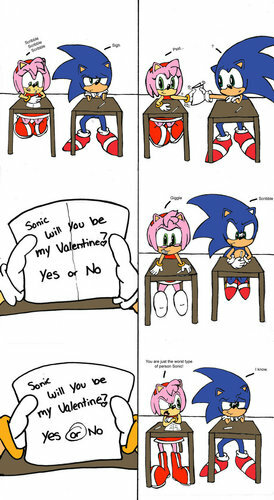 thats funny lol amy looks so cute waiting 4 his answer but she gets an "or" ha! HAHA! amy is soooo stupid, that's too funny. Its so Funny XD XD. But POOR AMY!! !